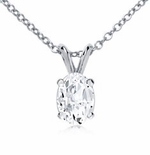 Our Classic Solitaire Cubic Zirconia Pendant and Necklace Collection features the best highest quality of Russian formula cubic Zirconia lab created man made simulated diamonds in all of the popular diamond shapes. All of our laboratory grown stunning diamond quality cubic zirconia stones are basket set or bezel set in the same high quality fine jewelry mountings used to set genuine diamonds. Solitaire pendants make for a perfect gift as a compliment to a pair of earrings or for someone who does not have a diamond look sparkler around their neck. Each traditionally styled pendant includes a 16 inch fine rope chain necklace and is also available in an 18 inch length. 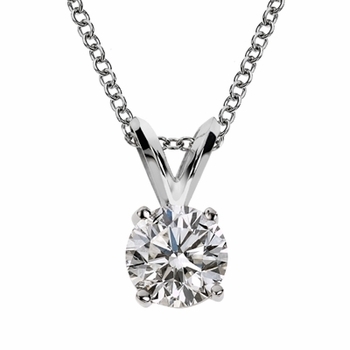 The chain slides through a rabbit ear bail, also known as a V shaped bail on the basket set pendants and an integrated hidden cut out bail on the bezel set pendants. 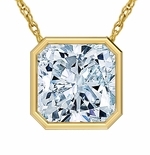 Our classic solitaire diamond look cubic zirconia pendants are available in 14k yellow gold or 14k white gold. Platinum and 18k white gold or 18k yellow gold are also available via Special Order. If you do not see the carat size or shape you are interested in, simply contact us at 1-866-942-6663 for Special Order availability and pricing.